What Hurricane Katrina did was kill nearly 2,000 people and displace and relocate 1 million people throughout the Gulf Coast. In New Orleans the population of the city fell by half due to loss of homes and displacement. Fifty percent of the city's residents' homes were uninhabitable or lost, and multiple generations of New Orleanians were forced to move. 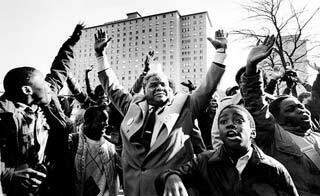 Historical and proudly black communities were wiped out. Now some people like McQueary will likely say, but New Orleans is back! Who is New Orleans back for? For people who look like me (i.e. white people). Not the people who lived in those predominantly black precincts. Let's be honest, the word white often makes white people uncomfortable. Many of us who are white, when asked to describe ourselves, do not include our race in our personal descriptions. A typical white person's description of their self will likely include their gender, their ethnicity, and their looks. For example, my description would sound something like this, "I am male, of Italian and German descent, 5' 8" and bald." Notice how race is not mentioned. The reason many white people don't often think in terms of our own race is privilege. It is privilege that makes it so we don't have to think about our race every single minute of every single day. In 1989 a professor named Peggy McIntosh wrote a paper titled White Privilege: Unpacking the Invisible Knapsack. [PDF] In this document she lists many privileges that white people have been taught to ignore and just accept as normal without even thinking twice about them. To educate the public about Nakba, the 1948 Palestinian exodus when over 700,000 Palestinians were forced from their homes, the Chicago chapter of the American Muslims for Palestine are hosting two events in Chicago this May. The first event was Thursday at Daley Plaza, where a group of volunteers, 31 in total, handed out informational materials at Daley Plaza. The materials aimed to educate passers-by about the 1948 events and what Nakba means today. Most of these volunteers came from Universal School in Bridgeview. 3,000 total copies were distributed, according to Kristin Szremski, director of media and communications at the organization. Szremski said that reaction Downtown was mixed. While some people read the educational brochure and were intrigued by it, others were rude and definitely anti-Palestinian, she said. She said this was difficult for the students who encountered this since they are Americans of Palestinian heritage. On Saturday, the chapter will host an event that includes a Palestine Parade, authentic Palestinian cuisine, a bazaar, folk dancing and songs and bread, freshly baked on traditional 'taboon,' or ovens outside of the Universal School in Bridgeview. "We want people to know that the Nakba still continues today in the Israeli apartheid policies that result in the military occupation of Palestine, the restriction on freedom of movement, the demolition in thousands of Palestinian homes and the random arrest and detentions of thousands of political prisoners, including 700 children, every year," said Nida Sahouri, AMP-Chicago chapter chairwoman. "We Americans fund this with our tax dollars. We just want people to know the truth so one day they will pressure Congress to approve a more fair and balanced foreign policy in the Middle East." Last week in Chicago and throughout Illinois we suffered through the latest installment of the polar vortex. Unfortunately, the frigid weather brought out a heated and ugly side of many students at University of Illinois at Urbana-Champaign (UIUC). On Sunday the 26th, all UIUC students received an email from their school's chancellor Phyllis Wise reading, "Classes and operations at University of Illinois at Urbana-Champaign will proceed as scheduled Monday Jan. 27. Please use caution as you proceed in and around campus during what is forecast to be an extremely cold and windy day and night." In an elegantly simple bit of journalism, Dan Weissman took a camera on the Red Line. Read his full story. 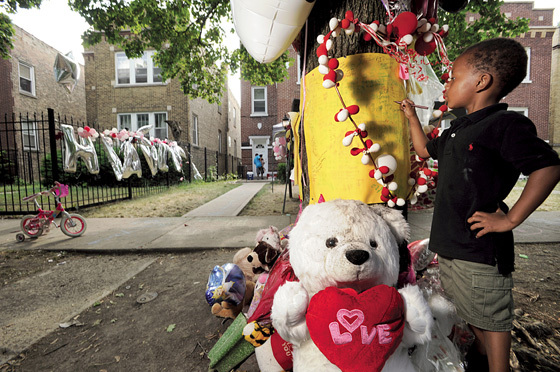 Part of WBEZ's Race: Out Loud series. 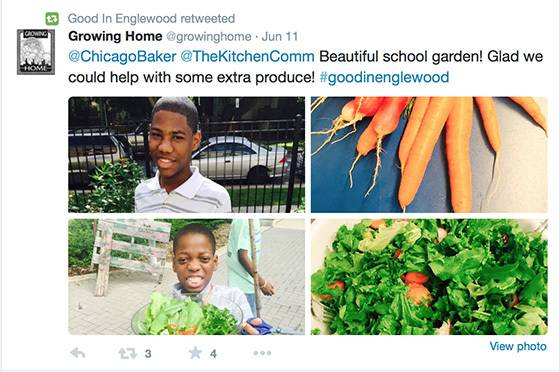 GB has already cited this great story by Ward Room's Ted McClelland, but I would like to give it a little longer treatment because it's so well written and speaks to an issue that we generally, for some reason, just tacitly accept: that Chicago, heart of the bluest of the blue counties in the country, is deeply segregated. In fact, the third most segregated city, by the Census' count. 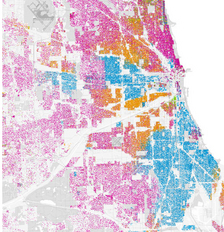 Chicago's famed racial segregation goes back nearly a century. When blacks arrived here from Mississippi and Alabama to build weapons for the World War I doughboys, they were forced to live in a narrow strip of land known as the Black Belt. 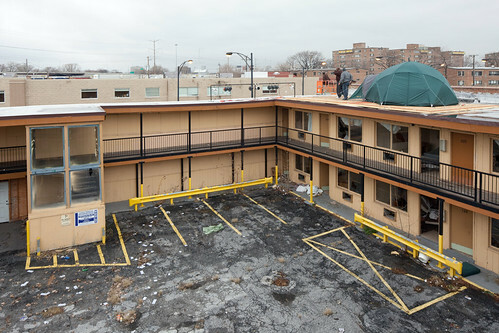 The ghetto finally burst open in the 1950s and '60s, consuming most of the South and West sides, despite Mayor Richard J. Daley's efforts to hold back the tide by crowding blacks into housing projects and walling off their neighborhoods with highways. The city is roughly a third white, a third black and a third Hispanic, but most Chicagoans live in neighborhoods no more diverse than Ireland, Nigeria or Mexico. In some places, you can drive under a viaduct and see the world turn a different color. Chicago's greatest monument to segregation is a 12-foot-tall berm that carries the Burlington Northern Railroad through the Southwest Side. 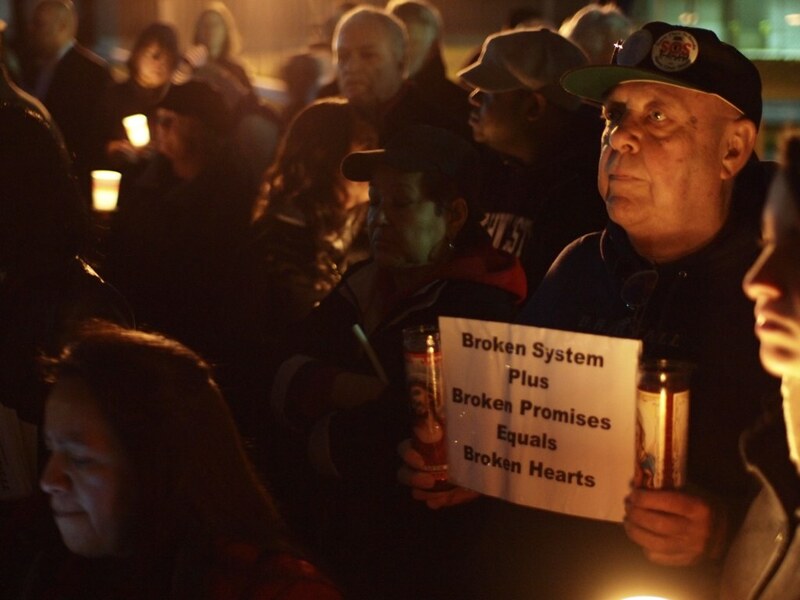 It separates Lawndale, a once-Jewish neighborhood that "turned" in the 1950s, from Little Village, an old Eastern European neighborhood that is now Hispanic. The Poles and Ukrainians established the tracks as a racial barrier, especially after Lawndale went up in flames following Martin Luther King Jr.'s assassination. The custom has persisted with the new residents: South of the tracks, it's 97 percent Hispanic; on the other side of the tracks, it's 89 percent black. WBEZ broke a big story yesterday, releasing a video that appears to show two Chicago Police Department officers engaging in what the station describes as "questionable" behavior. Standing outside a squad car, the officers allow a large group of men to gather closely around the open back door to hurl insults as well as apparent gang signs and slogans at another man, who is visibly shaken, in the back of the cruiser. Vega says he first came across the video on Facebook. Assuming it would be quickly pulled, he ripped the video, downloading it to his computer. As he predicted, the video and the user account did disappear within a few days--leaving Vega the only one known to have a copy of the tape besides its original owner. The hunt for a "consensus candidate" to represent the African American community in the forthcoming mayoral election ended several weeks ago. Few outside the inner circle of the decisionmaking body of the Chicago Coalition for Mayor, made up of many prominent African American politicians in the city, know how the consensus was reached, and at first, no one seemed very forthcoming with details of the process. But an incredible little interview on Vocalo.org with one of the process's participants slipped almost entirely under everyone's radar last week, despite the inside look it gives on how the candidate was chosen. Christopher Cooper, a local civil rights attorney, had considered throwing his hat into the 2011 mayoral race, only to promptly retract it. Rep. Danny Davis of the 7th district was eventually chosen, and he's quickly entered into campaign mode (which thus far appears to mostly mean lobbing bombs at Rahm). But let's rewind for a second. How did this "consensus candidate" sausage get made? Everyone acknowledges that it's a messy process--the very idea entails boiling down all of the complexities of a large, diverse community, with all its different ideas and interests, into one candidate who supposedly represents all of them--but there are few insider accounts of how the actual process went down. Enter: Cooper's appearance on The Barber Shop Show last week. The things that the coalition said to me...certainly implied, "We're going to make it impossible for you to get even a dime." The coalition made it clear that it would destroy any black person who dared run against "the Consensus Candidate." The individuals involved in the coalition made some very, very serious threats... essentially, we will destroy you, we'll make sure you don't get name recognition, we'll work against you. Cooper goes as far as naming a few names during the interview. His honesty and openness in discussing the behind-the-scenes action in local politics is almost shocking in a city where political decisionmaking has historically been done with little transparency. In the middle of the interview, Cooper says, "I'm young, and if I plan to have a future in Chicago politics, I really need to be careful about making members of the coalition angry." If that's the case, he better hope no one from the coalition minds his airing of their dirty laundry on-air. To hear Cooper's interview, listen to the first segment of The Barber Shop Show here. Chicago consistently ranks among the most racially segregated cities in the country--which shouldn't surprise anyone who has traversed the city with their eyes open. But Chicago Breaking News is reporting a particularly bold case of alleged racial discrimination by two white homeowners in the Bridgeport neighborhood who, according to the Department of Housing and Urban Development, agreed to sell a home to a black couple for $1.7 million, then inexplicably took the home off the market. According to the complaint, Lowe [the sellers' real estate agent] said in an interview while under oath that while he was representing the Sabbias [the sellers], Daniel Sabbia told Lowe "he would prefer not to sell the home to an African-American, though he qualified the testimony, saying 'but if it was for the right price he did not care who bought the house.' "
"It's amazing that in 2010, in this day and age, this type of thing is still going on." Activists demonstrate against the Westboro Baptist Church. The Westboro Baptist Church, a hate group that chartered themselves as a church to get away with their harassment of Queer groups, Jews, military families and others, conducted a tour of Chicago on March 8th. The group of five lonely haters targeted Jewish centers, protesting everything more modern than the middle ages at Hillel's at UIC and the University of Chicago before holding their signs outside of the Israeli consulate. Hundreds of queer rights activists rallied against the Westboro group. 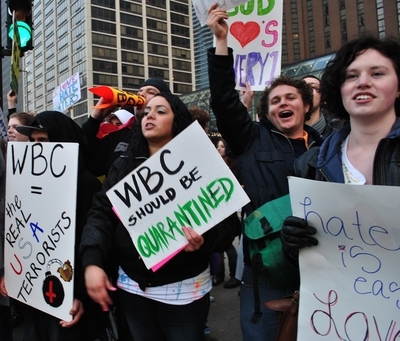 Activists used humorous and satirical signs to mock WBC. 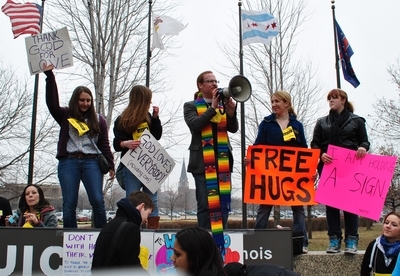 UIC student Jason Connell used the appearance of the hate group to raise money for queer rights groups such as Human Rights Campaign, International AIDS Foundation and Chicago based Jerusalem Open House. Donations were named in honor of the Westboro Baptist Church and community thank you cards will be sent from the non-profits to WBC leader Fred Phelps. Connell called it a, "Lemons to Lemonade" situation. Kurt Esslinger Lee, an Presbyterian ordained minister from the UIC Agape House Christian Campus Ministry said, "We don't care so much about this group of hate, we know that they are not going to listen to anything we say. What we are care about is the closeted, afraid LGBTQ students around UIC who are are taught to hate themselves to think that god is also loathing them, so we reaching out to them to break through that ignorance." Video of the event is available through Dogstar7's Youtube Channel. Satire of WBC is at the Youtube Channel of CrazyPastorFred. Public sector workers were once among the most abused members of the labor force. It was when Dr. King turned his attention to the working class--to fighting on behalf of the working classes of all races--that he became intolerable to the status quo. He was standing with AFSCME workers in Memphis when he was murdered. Today the constant assault on the public sector workers is just an echo of the eternal assault by the right wing against the rights of the working class. Back then, it was the public sector workers that were dragging down the working conditions and wages of the heavily unionized private sector; today, the situation is reversed. Ignore the crocodile tears of the right wing ideologues about taxpayers' money. Breaking the back of workers' organizations is the ultimate goal of the right wing, wherever those organizations exist. Wow. That's One Nasty Flier. 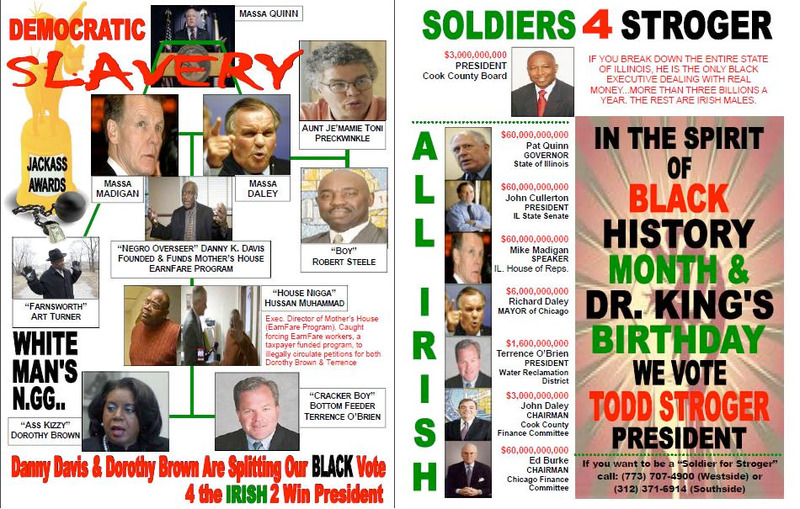 Former gang member turned political consultant Wallace "Gator" Bradley is supposedly behind this nasty flier in support of Todd Stroger for Cook County Board President. 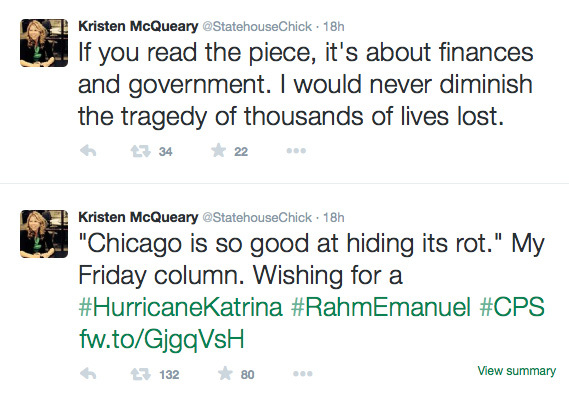 The Illinois Review, the Chicago Current, and Chicagoist have covered this as well. "If none of us win," Mr. Stroger said of himself and Ms. Preckwinkle and Ms. Brown, "there will not be a single black executive in the state who deals with real money -- you know, like a billion dollars or more." "If you break down our state," he continued, "and you look at who's the governor, who's the speaker of the House, who's the Senate president, who's the mayor of the city of Chicago, who's the water reclamation district president, who's the chairman of finance for the city and who's the chairman for finance for the county, you'll find that they're all Irish males." So even if this flier was produced without coordination with the Stroger campaign, it can't be dismissed as the one-off act of a lone radical. There is a current of thought among some segment of the black political class that may be seeing the refusal of their traditional white allies to step up as a hostile act. The media, by typically pigeonholing "black" candidates, must feed this perception. 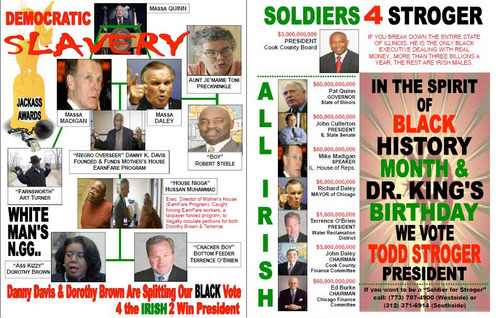 But given the cruel and subjective nature of identity politics, this flier is actually more harmful and hurtful to Dorothy Brown, Toni Preckwinkle, and the other black politicians maligned as "sellouts" and race traitors. The outcry over Rod Blagojevich's statement equating shining shoes with blackness is offensive exactly because it places unfair expectations and roles on black men and women. Similarly with this flier, these black politicians are being told how they have to behave and who they have to support to "qualify" for blackness. These two fliers have been lighting up the blogosphere. You see posts at Capitol Fax, Illinois Review, Newsalert, Chicago Current, and there's even one at Instapundit about these fliers. Rich Miller mentions the flyer in terms of the news that Rep. Bobby Rush, who he says is "infamous for his race-baiting ways," will endorse Stroger. Then goes back and says that Rush would "have a tough time topping a group called 'Soldiers for Stroger,' headed by Gator Bradley, which is distributing some pretty nasty fliers on behalf of the board president." The Stroger campaign released a statement late last night denying any involvement. "The Stroger for President campaign did not produce or distribute the flyers in question. The Stroger campaign does not endorse or condone this type of behavior or activity," it said. 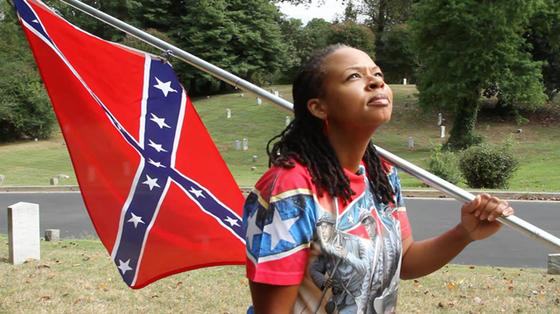 I posted here a video about Black religious leaders attempting to drum up support for Todd Stroger. The concern there as it appears to be here is that without Stroger, blacks could lose the County Board presidency. You know it just seems so easy to pull the race card! Danny Davis will announce this morning that he will seek reelection for his 7th District Congressional seat. Davis' announcement didn't come with any endorsement, but he did say that at least part of his reasoning was not wanting to split the black vote among four black challengers. We all have our feelings about Todd Stroger and the job he's doing since he became county board president in 2006. Today we find out that the state House has voted in favor of a bill to reduce the threshold for overriding a veto from fourth/fifths of county commissioners to three/fifths but also were unable to roll back the seemingly unpopular penny on the dollar sales tax. This video from ABC7 is really old news from yesterday. Stroger got one out of two today, but seemingly got a decent boost with this endorsement yesterday. In endorsing Stroger for re-election to the county board president slot, they called for Rep. Danny Davis, Ald. Toni Preckwinkle, and circuit court Clerk Dorothy Brown to remain in their current position. Even with this boost Todd Stroger has a long way up. Watch this video interview Stroger did in Springfield with Rich Miller at the CapFax, it's indicated here by Miller. Check out this report from Mike Flannery, it's indicated there as well. Danny Davis says he has polling that has him leading Todd Stroger in an election in both videos from ABC7 and Mike Flannery. Either way in making this endorsement the ministers know that most of the people in their congregation may well listen to them. Indeed in wanting to clear the field of the black challengers, they want to be sure that a black will remain in the position of county board president. There is a white challenger in Terrence O'Brien who currently sits on the Water Reclamation District. Well, there is a question in my mind. Were these ministers wise in endorsing Stroger in this race? Couldn't they have endorsed any of the challengers? An April study by the Washington, D.C.-based Sentencing Project found that the number of African Americans incarcerated for drug offenses dropped 21.6 percent nationwide from 1999 to 2005, while the number of white drug offenders increased by 42.6 percent during the same period. Of course, the study is an evaluation state incarceration rates, not federal rates. And while the rate of incarceration federally increased for blacks, it tracked similarly for whites and Latinos, no change there. Nor did drug use rates change--generally. But they did drop for crack-cocaine a drug that, unlike marijuana, will nearly always result in arrest if you're caught possessing it. The drop in incarceration reflected to a significant degree drops in arrest rates and convictions for blacks caught up in drug offenses. First, we have seen over time that drug offense arrest rates are largely a function of law enforcement practices, rather than absolute levels of drug use or selling. This is interesting. 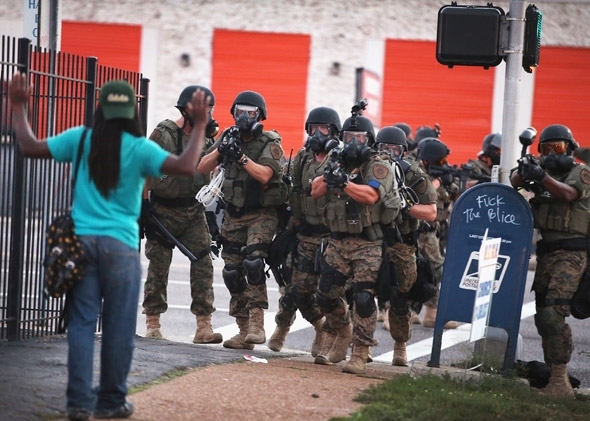 What institutions nationally help determine the practices of local law enforcement agencies? A radical, in his own words. If we are to achieve a real equality, the U.S. will have to adopt a modified form of socialism. "I think all discussion of race is a painful diversion," Rev. Jackson said Wednesday when asked whether he agreed with U.S. Rep. Bobby Rush, D-Chicago, that the job should go to an African-American. "Roland's case is a legal case, it isn't about his race, or gender or religion," Rev. Jackson said. "Does the governor have the power to appoint a successor, yes or no? I think yes." The veteran Civil Rights activist, whose son, U.S. Rep. Jesse Jackson Jr., D-Chicago, was widely seen as a potential candidate to fill the slot, praised Mr. Burris, a former Illinois attorney general and comptroller. "He's always been an outstanding public servant operating with great credibility," Rev. Jackson said. "There's almost a consensus on his reputation. The issue has been the governor, not Roland." Hmm, I think we could have used Jackson's input during the whole race-baiting episode. He waited until it looked like Burris might actually get his seat! By all accounts, Cong. Jesse Jackson, Jr. is on the "short list" of possibilities to fill Barack Obama's vacated U.S. Senate seat for the next two years. Some newspapers and activists have been actively lobbying for Gov. Blagojevich, who has sole discretion in the decision, to appoint Jackson.